Physically, the people of Israel carry a spiritual duty and must work on themselves in order to implement their mission in life. Today, the concept of “Israel” is defined not by birth but by the inclination of a person to reveal the Creator. Those who have this predisposition are named in accordance with their vector, Yashar-El, directly to the Creator. Those who aspire to fulfill their mission stand apart from the general masses. Also, due to two thousand years of exile and mingling with other nations, this part has expanded by adding the ones who, in the material sense, come from other backgrounds. Thus the inner “core” is surrounded by those who happened to achieve spiritual attainment in their prior lives. They retain special Reshimot and are guided by the “unpleasant” upper governance that sends predicaments and hardships to them. Finally, the external circles consist of “the nations of the world” that are arranged in accordance with their spiritual roots. The entire structure, in essence, is spiritual. However, so far, we can see only the bodies rather than the souls. We associate people with their bodies, which are born, live their lives, suffer, multiply, and then die and turn to ashes. In fact, bodies are a simple projection of a spiritual process at its lowest material level. As an example, imagine an operating system chain that is comprised of 125 windows. At this time, in our perception, we only can see the first window that displays just physical objects: stones, trees, mountains, animals, the sun, the moon, stars, and much, much more, including people. We see the entire world that is just a depiction of the upper realm. That is where the roots i.e., the forces that draw the current picture on our screen, are planted. Using neurobiological terms, I’d say that the picture on this material plane is being created in the back of our brains by electric impulses. This makes possible the projection of the deeper worlds that take the shape of this material externality and we can view only one window, one level, at a time. Our five senses do not allow us to discern anything beyond that. If we want to see the cause, the true picture, we must develop five bestowing senses. This transition is made by the Surrounding Light, which we trigger with the help of the group, by studying the wisdom of Kabbalah, and doing everything it takes. The path is open. In the meantime, we live in only one “image” of our world, and we reincarnate in it until we reach the next level. At this point, each part separately and all of them together are “tuned” to elevate us internally and bring us closer to a screen that shows a deeper image. Everything exists only for this purpose. Everything is coordinated. In other words, whatever goes on in the world is synchronized with each one of us. A transition to a higher level is the purpose of everything that ever comes about. Which elements of the picture that we currently see can facilitate this process? At each level, we see parts of inanimate (I), vegetative (V), animate (A) and speaking (S) nature. So, our task is to choose the speaking level and split it into components that can be used. In general, there are three components. We already have named all of them: 1. those who aspire directly to the Creator (Israel), 2. the Jewish people, and 3. the nations of the world. In order to ascend, one should keep a close connection with Israel since this part pursues the same goal as all of us do, that is, transitioning from one screen to another. As to “the Jews,” their Reshimot are still asleep; the Reshimot exist, but have not appeared, whereas in the “nations of the world,” these Reshimot remain in a potential, they have never appeared since they received them solely as a result of a mutual inclusion with the people of Israel that scattered throughout the world after the destruction of the Temple, that is, after the shattering of vessels occurred. We illustrate this with the structure of a vessel that consists of two major parts: Galgalta ve Eynaim (GE) and AHP. 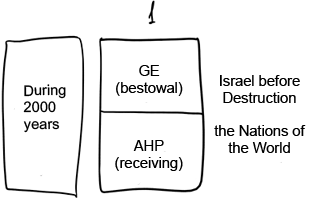 At first, (1) GE is in a primary state of bestowal. It corresponds to Israel before destruction. AHP stands for the nations of the world, which are in the state of receiving. In its second state, Israel descends to the nations of the world, and throughout two thousand years they mingle with each other. Then, the Light that Reforms (the Surrounding Light, Ohr Makif – OM) begins its work. It influences a pile of broken vessels and they begin waking up. We don’t know where they come from: the ten missing tribes of Israel, the captive parts of the people of Israel, or the nations of the world. Actually, it doesn’t matter. The main thing is that they want to rise and become Galgalta ve Eynaim. That is, they desire to bestow. It’s as if one suddenly wakes up and this mission becomes more important to him or her than all the “quagmire” of this material existence. At that point, those who ascend to bestowal are called Yashar El (directly to the Creator) according to their intention and to what they cherish. Others split into two parts: “Israel in exile” and the nations of the world. The Surrounding Light primarily influences the parts of Israel since it’s their responsibility to correct others. Consequently, our work with the world must be coordinated with this pyramidal structure. 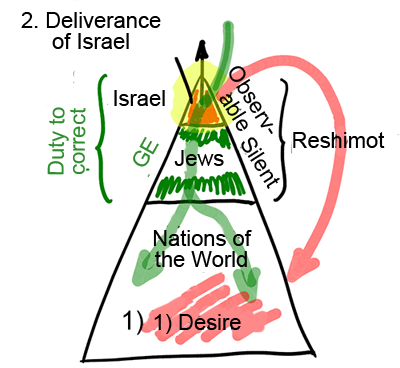 On the top are those who aspire to the Creator (Israel), then come the “Jews.” Both parts have Reshimot, either in their explicit or “silent” forms. The upper part is already walking its spiritual path, whereas the other part will join them only under pressure or out of desperation since these are the two parts that are contrary to the nations of the world and that bear the burden of correction. Generally speaking, today the entire system is transitioning to a new phase. Previously, the Jews excelled others in many spheres of life. Currently, other nations have started prevailing. The situation constantly changes. The nations’ desires manifest now more openly with each passing day, and that’s why they succeed all over the world. In a little while, we’ll see the Jews gradually fade in the endeavors of this material realm, whereas the nations of the world, on the contrary, will prevail. They will replace the Jews in things that are associated with material success, while the Jews will continue attaining a higher level. 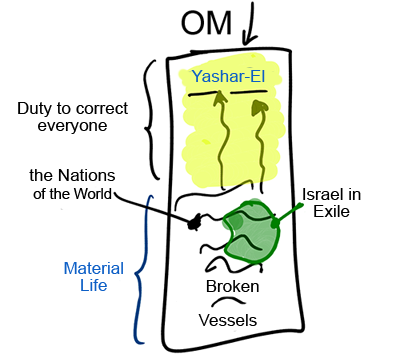 This explains why the people of Israel anticipate disasters that are of an internal nature; if they want to change and are not able to do this on their own, they will need the Creator on the correct path of acceleration, or, God forbid, there will be further misfortunes imposed by the nations of the world. In this world, Israel will stay in pretty good shape with the exception of experiencing animosity from other nations. This is the way the upper governance manifests Itself. If one doesn’t correct what one must, then it turns into a factor of coercion. 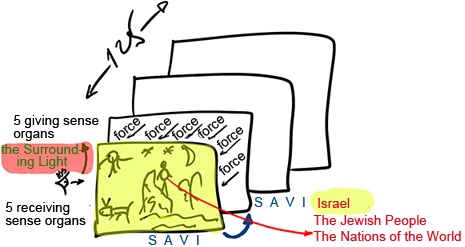 This means that if Israel doesn’t correct its interpersonal relationships and doesn’t bring people to unity, which, in fact, is a place of the revelation of the Creator, then it will become the source of troubles and misfortunes that will come from the nations of the world in their worst and yet unprecedented forms. It’s a law. There is nothing we can do about it, unless we do our job properly. The job is to self-elevate and then pull others forward by disseminating the wisdom of Kabbalah and by spreading the methodology of integral education that will unite people and teach them the ways to love their neighbors as themselves. The duty to correct automatically falls on those who aspire to the Creator and whose Reshimot already have woken up. They have no chance to escape since the law is preordained. Besides, this duty is imposed on the Jews as a nation. Moreover, in the course of correction, when it reaches a certain level, the Jews who bear the Reshimot that are associated with the destruction of the first temple and not the second temple will emerge, the ten lost tribes. They have never experienced further shattering and thus comprise cleaner vessels, whereas we belong to a heavier part since we went through the shattering twice. The Light descends to the vessels of Galgalta ve Eynaim and then through the Jews reaching the nations of the world. On the other hand, we must conduct dissemination not only in Israel but in other countries as well, directly among other nations since, as Baal HaSulam writes, without doing this the Jewish people won’t get out of the exile. After all, their only goal is to deliver the Light to others, to be a “Light to the nations.” So first we must awaken a desire in the nations of the world (1). Only then will the deliverance of Israel take place (2). The Creator, being beyond time/space, cannot be defined, limited to ever having ‘done something’ in an alleged past. Such only exists to the (delusional) creature, bound by time/space. Also, as the creator, being (infinite) beyond comprehension, bestows also beyond comprehension; the notion of choosing (a chosen nation of israel) surely refers to a quality of the creature – not the creator? Witnessing daily, the tragedies of the “claim to a land of Israel,” is it not time for the truth of such things – as the true meanings of ‘nation of Israel’ and ‘chosen’ to be realised?